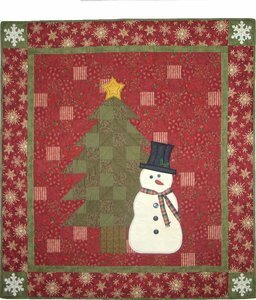 The Sweet Treasures pattern company began in 2004 with the release of "Snowman Sam". Truthfully, I stumbled into designing patterns. I volunteered to help with merchandising and working the floor at a new quilt shop that opened near my home. Teaching was truly my passion and I also began teaching classes. I'd whip up a little quilt for a display of fabrics and the customers always wanted the pattern. I began writing patterns for the customers. Then it hit! My brain just "started going there"! I would look at something and think "it'd be really cool to make a quilt like this, and you could do that .......I really couldn't help but design.....you get the picture. Rewind a bit. I grew up crafting and working with my hands. I began sewing on my mom's featherweight sewing machine in the 6th grade. I LOVED sewing and crafting with fabric. I sewed and sewed and sewed. I sewed for myself and others, then my children. In the early '90's I took a sampler quilting class and was hooked! Hooked is an understatement! Most of my sewing from that point on was quilts. Most of the other crafts went by the wayside. I just loved quilting, working with all that wonderful fabric. Fast forward to today. The quilting community is such a wonderful community to be a part of. Quilters, students, fabric companies, shop owners.......I feel sooo very blessed to be a part of it. To work at something I'm passionate about. Sweet Treasures has grown and grown. I've designed 100+ patterns. I opened my own studio for classes, hired three employees and now have an online shop where we sell our original patterns, kits featuring quilts from Sweet Treasures patterns (and others we love), wonderful fabric and our favorite tools. Sweet Treasures only made it this far with the help of the quilting community. Support and encouragement by family, friends, fellow quilters, shop owners and fabric companies who all played a part in "growing" Sweet Treasures. With my deepest gratitude I thank you!! I hope we can continue along this wonderful ride together.